Assign each of these categories to small groups. Use classroom or library resources such as the internet, encyclopedias and non-fiction books to find answers. Gather and share the facts each group discovers. Who was the engineer for the bridge? Who was against building the bridge? Why did supporters feel a bridge would be a good idea? Why does the bridge sway? What were the obstacles in building it in this location? What kind of bridge did they decide to build? Where is the Golden Gate Bridge? Be able to show the location on a map. Where are other suspension bridges located? Point out on a world map. How did they protect workers who fell during construction? Give choices to students for individual projects. Imagine that you are a radio reporter on the day of the dedication ceremony for the Golden Gate Bridge. Discuss the obstacles that were faced in the planning and construction of the bridge. Include words such as teamwork, structure, impossible, suspension bridge. Use a microphone and present your report. Design a poster that advertises the dedication day of the bridge. Include date, important information and a picture of the bridge. 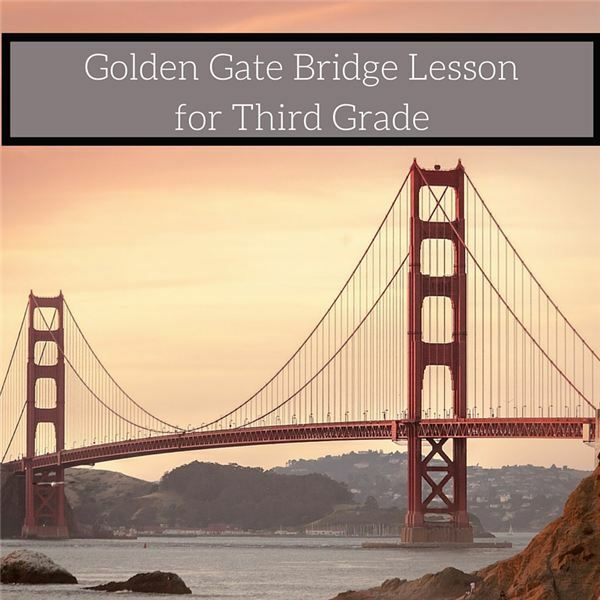 Create an acrostic poem using one of these words: Golden Gate, Teamwork or San Francisco. Write the word vertically on a piece of paper. After each letter write a word or phrase that begins with that letter and is giving information about the bridge. For example, G could say, “Glorious structure" O could say, “On the Bay," and so on. Wearing, Judy and Riddolls, Tom. Structural Wonders: Golden Gate Bridge. Weigl Publishers, 2010. Bunting, Eve. Pop’s Bridge. Harcourt Books, 2006.